Tell us about your child and how we can help. If your child needs enabling equipment such as a wheelchair, van lift, house ramp, adaptive car seat or stroller, a specially-equipped bicycle, tricycle, or stairlift, please take a moment to apply below. Assistive Technology provides communication devices for children with physical and cognitive disabilities. If you need help communicating with your developmentally-disabled child, please apply below. The Variety KC GoBabyGo! Program provides modified toy ride-on cars to provide mobility & sociability for children with special needs. If you would like your child to participate, please fill out the application below. Variety’s Assisted Technology program provides communication devices and technology so children with physical and cognitive disabilities can communicate. For parents of special needs children, these devices are lifelines to understanding their children. It means being able to ease tense and frustrating situations. It can mean getting medical help faster – and more accurately. It also means more ways to interact and share with their children. For the kids – these devices give them a voice! It’s a way to reduce frustration by being able to communicate needs and wants. It provides them with a way to engage with their friends, teachers, families…and community. Born in this digital age, even very small children are able to operate these tablets and apps. Therapists and physicians stress that early intervention is best. Many Variety kids are exposed to this technology in a school or therapy setting, but without the same technology at home – they experience the most frustration with their close family and caregivers. In some cases, innovative technology such as Vocal ID, actually gives the child their own voice. By taking samples of sounds the child can make, Vocal ID can replicate what the child’s speaking voice would sound like. Then that unique voice can replace a robotic voice on their computer. Can you imagine hearing your child’s voice after so many years of non-verbal communication? It’s truly miraculous! If you believe that every parent should be able to talk with his or her child and that every child deserves to be heard, please join in our cause. If you need help communicating with your developmentally-disabled child, please apply for our Assisted Technology Grant program now. One way Variety KC helps kids with special needs, right here in the Kansas City area, is through mobility grants. Mobility is a broad term. It might mean a ramp so a family can get a child in a wheelchair safely into the car. It could be an actual wheelchair, a Go Baby Go car for a toddler, an adaptive bicycle or a gait walker. Some mobility issues may surprise you – for example, heavy power wheelchairs prohibit many children from entering a home with stairs. If the chair and child are too heavy to lift, they miss out on birthday parties, holiday celebrations, even seemingly simple things like trick-or-treating…..all because a step has prevented mobility. Mobility issues can be a matter of inclusion. Without the proper equipment, some kids with special needs aren’t able to participate in sports or team activities. Without the proper kind of playground surface, some kids can’t safely navigate a playground. 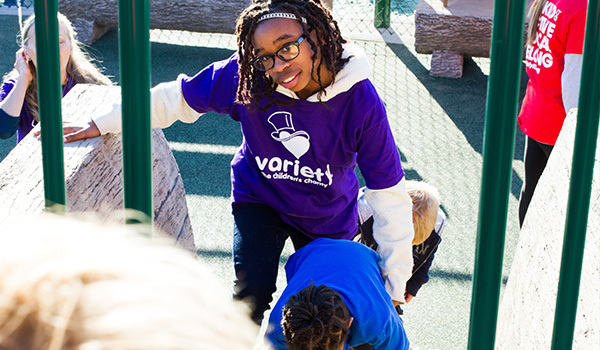 Variety KC believes all kids deserve to Be Active, Be Social, and Belong. If you believe that too – then click here to donate. If you need help purchasing equipment for your child with a mobility related challenge, please fill out our mobility grant application here. The Variety KC GoBabyGo! Program provides modified toy ride-on cars to provide mobility, a sense of independence & sociability for children with special needs. These cars also provide caregiver relief as the kids are frequently too young for insurance to support wheelchair purchases, leaving caregivers to transport them. The cars are purchased by Variety KC, then engineering and therapy students (and even Robotics Teams!) work to adapt the cars to each child’s needs. It might be the addition of large start buttons for a child who is visually challenged, or swim noodles strategically placed in areas of the car to provide safety. 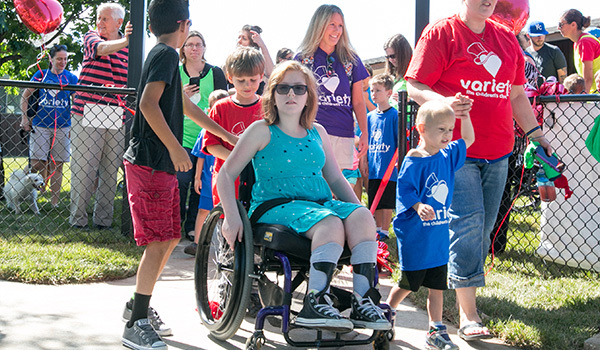 If you would like to see a child’s face light up as they take their first ride of independence, then donate to help Variety KC here. 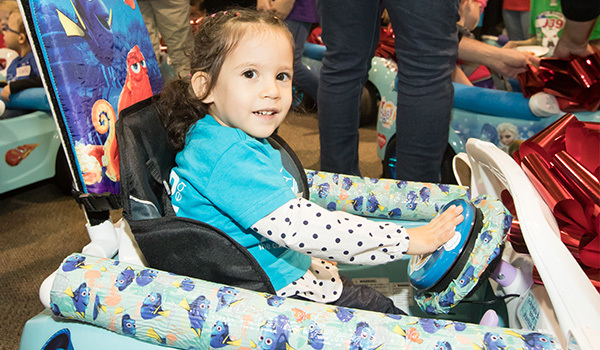 If you have a child who has experienced a Go Baby Go car at therapy or have seen stories about Go Baby Go – and believe your child would benefit from a car – fill out a grant application here. Because we are powered by high school and university students, our application is not available during the summer months (May-August). Who does Variety KC help? Children and young adults with special needs (up to age 21) in Kansas City and the surrounding areas. You can learn more about our recipients on our blog, and stories of projects we’ve funded here. Fill out one of the grants that applies – Go Baby Go! mobility car, Mobility equipment, or Communication devices. What materials do I need to have on hand before I fill out an application? TO COMPLETE YOUR APPLICATION, THE FOLLOWING INFORMATION IS NEEDED. ❑ Letter(s) of verification from professionals you identified (therapist, doctor, social worker) who are most familiar with your child’s needs. This letter should specify your child’s needs for the equipment requested. ❑ Copies of determinations from relevant insurance programs. ❑ Copy of latest federal income tax return, pages 1 & 2. ❑ Copy of the quote for your request directly from the vendor. ❑ Clear, detailed description of equipment to meet child’s needs. ❑ Address all items as stated in the Addendum for appropriate equipment being requested. ❑ Two or three assisted technology bids from suppliers (Variety can assist you in choosing a vendor). ❑ Signature on Release of Liability Form. ❑ Signature on Affirmation of Truth Statement. ❑ Authorization to Use Name & Likeness (signature optional). ❑ Signatures of all legal guardians & complete demographic data. ❑ If funding is approved, we do require photographs of child with equipment (preferably within a month of project completion). Please use 35mm film or you can submit via email to varietykc@gmail.com. How can I help Variety KC? Please consider volunteering, donating, hosting a fundraiser or sponsoring a Variety event.